2 Bedroom Flat For Sale in Falmouth for Guide Price £250,000. The communal entrance has a door entry system in the inner porch area, from here there is a communal entrance hall with seating and access to the wardens office, resident lounge, the lift and stairwell. Doors to all accommodation, night storage heater, built in storage cupboard which houses the water tank with shelving and storage space under, telecom system, loft hatch, coved ceiling. Two piece suite comprising of a close coupled w/c and pedestal wash hand basin with tiled splash back. Extractor fan, coved ceiling. Double glazed window to front elevation taking in the stunning views over Falmouth Bay down to manacles and across to St Anthony's lighthouse. Built in wardrobe with hanging and shelving space with mirrored doors. Night storage heater, telephone point, coved ceiling. Double glazed window to front elevation taking in the stunning views over Falmouth Bay down to the manacles and across to St Anthony's lighthouse. Wall mounted electric heater, coved ceiling. Fitted with a range of wall and base units with roll edge work surfaces over incorporating a stainless steel sink and drainer with mixer tap and tiled splash back, partially tiled surround. Built in electric and hob with extractor fan over. Spaces for fridge and freezer, vinyl flooring, coved ceiling. A three piece suite comprising of a double shower cubicle with shower over, close coupled w/c, wash hand basin with mixer tap and cupboard under with tiled splash back and partially tiled surround. Two extractor fans, tiled effect vinyl flooring, coved ceiling. 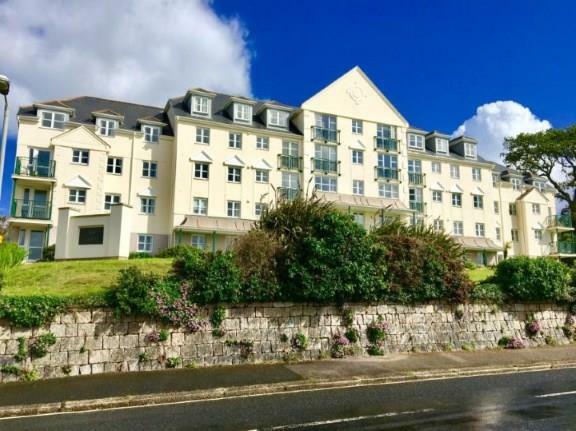 The apartment has the use of the communal facilities within the development, these include the residents lounge within the building that enjoys views over Falmouth Bay. The use of the laundry room on the lower floor and guests suite which may be available for visitors to use. The development also has good sized communal gardens at the front with benches that view the bay along with parking to the side and rear with pedestrian access on the town side of the development.